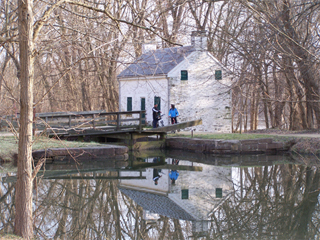 At canal milepost 19 is Pennyfield Lock, a favored spot for fishing expeditions by President Grover Cleveland. Cleveland spent time in Pennyfield's inn, a white frame house near the lock. The home was built in 1879 as a residence for a lock keeper, but fell into disrepair and was demolished in 2009. Land around Blockhouse Point, at a turn in the Potomac above Pennyfield Lock, is preserved as an undeveloped conservation area by the Maryland National Capital Park and Planning Commission, a regional agency formed by Montgomery and Prince George's counties. A boat launching ramp for small boats is located at the parking area for Pennyfield Lock. Boats may enter Muddy Branch and go through a stone viaduct under the canal for access to the Potomac. Pennyfield Lock, part of the C&O Canal National Historic Park, is accessible from Pennyfield Lock Road, left off River Road about 6 miles west of Potomac Village in Montgomery County, Md. The lockhouse at Pennyfield Lock has been rehabilitated and available for overnight visits through the "Canal Quarters" program operated by the C&O Canal Trust. The building is unheated, with no heat or electricity. It reflects the early history of the canal. For more information on the Canal Quarters program, select this link.